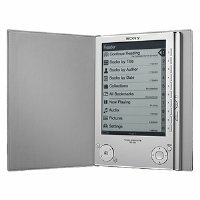 Sony PRS505/SC Reader Digital Book The Reader Digital Book holds about 160 eBooks or hundreds more with optional removable memory cards. Its portable size makes it the perfect travel companion, allowing you to read a variety of books whenever and wherever you want. With thousands of eBook titles available at the eBook Store from Sony, you can choose to download new releases, classics and popular book titles as well as view other document formats such as Adobe® PDF10, RTF, TXT, BBeB® and Microsoft® Word. Its long battery life lasts up to 7,500 continuous page turns, and the amazing paper-like screen technology is easy on the eyes.